On their self-titled debut, the Carlsonics deliver eleven tracks of pure, unadulterated bash 'n' rock garage tunes that shimmy and shake with a wild, drunk stagger. Thus, giving the songs an unpredictable edge, while the band plays straight ahead, going for it, playing, loud, intense, and with plenty of passion, ensuring even the ghosts of the garage rock era can hear their take on the style. In doing so, they deliver a powerful slab of neo-garage. Getting you off your bum and onto the dance floor, drink in hand, as you finally decide to down the thing so you won't have to waste any of it when you inevitably spill it 'cause you're getting into the music too much. 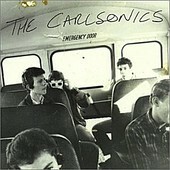 If it's too loud, you're too old, some have said, and the Carlsonics would agree, 'cause they keep it loud. Carlsonics is best enjoyed live (I'm sure) or at high volumes, because that is what rock 'n' roll is all about, and the Carlsonics understand. Just check out their debut. I'll give it a B.